Me: I found this show "Younger" that you can watch online. I watched a few episodes. The premise is that this 40 year old woman is pretending to be 26 so she can get a job. Primo: Why can't she get a job as a forty year old? Me: Because she has been out of the workforce for 15 years, raising her daughter. But her husband had an affair and gambled away all their money, so she has to go back to work. Primo: Why can't she get a job? Me: Because she was in publishing and when she interviews, they tell her that she's too old - that the world has changed too much since she was working. Primo: They can't do that! Primo: Can't she sue somebody? Me: Could we please just accept that this is the premise of the show and not argue about what should be, please? Primo spoke for five minutes, which is four minutes longer than I recommended, but he was good! He has gotten a lot better at public speaking. When we met, he was an occasional reader in church. He would clutch the lectern, sway side to side, and never lift his eyes from the text. Now he looks at the crowd, smiles, and takes cues - when they clapped, he stopped talking rather than forging on because you know - that was THE SPEECH and he had to KEEP TALKING. Do you guys know how amazing this is for an engineer who hates scope creep and STICKS TO THE PLAN NO MATTER WHAT? (As in, when he was looking through the boxes in the basement for his electric shaver, we came across some tapered-leg jeans - I know, I know - and I suggested that he put them in the Goodwill box and he was horrified at the suggestion that he deviate from the plan of finding the shaver because that was not the mission. Our friend J was there. J has run for office. I like him. We agree on some things, don't agree on other things. K from the ACLU was there. Again, I like her a lot. We agree on a lot of things - she thought the 8th grade trip to Denmark was as ridiculous as I do - and we had a good time. Primo gave his speech. People liked it. He was a million times better than the field organizer the party sent out. This kid was boring boring boring and would not shut up. He was talking about administrative and policy stuff. I was texting Primo that this guy was talking too long and this is what I meant by keeping it short, but Primo was a million times better than the field organizer. Then the guy who is running for Congress (the seat Primo ran for two years ago) spoke and he was fabulous. He is an accomplished public speaker - he is a small business owner who has been doing political advocacy for years, so he is very experienced. I was glad Primo did not have to go after this guy. I ate. The food was good because it was all homemade and not the usual Costco tray crap people usually serve. (Although having cooked for one fundraiser, I will never do it again because it is just way too much work, so I get it.) I met people and chatted politely and was the good Candidate's Wife. And then I went home - it was only a mile from our house, so I walked - and Primo stayed and that was fine. The end. I think it is fixed. I hope. PS The problem appeared to be that the word "toolator" (I spit upon you, toolator) appeared in the code for one of my widgets. I have killed the widget. PPS Have I ever told you my widget story? I should. and I say, "That's awfully long." He says, "I have a lot to say." I say, "That doesn't mean that people want to hear it." Primo: Are you concerned that the pipes in our house are lead? Primo: But they are lead! Me: I have not thought about it. Should I? Primo: It can cause mental problems. Hmm. And it has been since we moved into the house that I have become involved in politics. Me: There could be a connection. Primo: There could! It would explain a lot. Primo: I have to work on my speech. Primo: Yes. I will have to speak tonight at the BBQ. Primo: Yeah, I am thinking five minutes. Me: What? No! Five minutes is wayyyyy too long. One minute. One. One hundred fifty words. Primo: That is too short. Me: You are going to piss people off. It's a BBQ - they want to socialize, not listen to long speeches. Primo: This is a political event! Me: Remember at our reunion at the party Leebron's house and he gave that speech and would not shut up? Nobody wanted to hear him! Nobody wanted to listen to a speech! We wanted to talk to our friends! Primo: This is politics, not a reunion. Me: I don't know. I don't think anyone ever wants to listen to speeches. I don't. 1. We live in an affluent area. Not a Mercedes or a BMW in every garage area, but a mostly new cars, kids who can get braces, and families who go on vacation to a place, like Disney or the beach, for spring break rather than the kids just not going to school for a week, which is how spring break worked when I was a kid. 2. Other proof of affluence: We have lived in this house for eight years. Not once - not ONCE - has a kid knocked on my door and offered to shovel my sidewalk or cut my grass for money. I sold handmade doll clothes door to door when I was 11. When I was nine, a friend and I went door to door offering to sweep peoples' stoops and sidewalks for a dime. In my day (Hey! You! Get off my lawn! ), that was how kids got money - by working. 3. We already pay pretty high property taxes, which I guess I can live with because we get great services in our town (I love our library and get way more out of it than I have ever spent in property taxes) and the school district is one of the best in the state. Even though Primo and I do not have children, we care about the quality of the schools because someday, we will need to sell our house and because someday, we need these kids to get good jobs and pay into social security so we can retire. 4. I am usually very reluctant to buy overpriced product for a school fundraiser anyhow, although I will make exceptions for things like new band uniforms or books for the library for a school in a poor district. Also, I will buy Girl Scout cookies from any girl who has the guts to come to my door, ring the bell, and ask me to buy. I will not, however, buy from their parents. Parents! Let your kids sell their own cookies! Or, better yet, rebel against the tyranny of that kind of fundraiser and have a car wash instead. 5. Eighth grade trip? An eighth-grade trip? When did that become a Thing? Primo: But I wanted a Kit Kat bar. If they had had only Reese's Peanut Butter cups, I would not have bought anything. Primo: This is weird. There's this guy who's really into politics. I've only met him once or twice. Primo: He emailed me this long email asking really detailed questions, like how many doors I've done and how much money I've raised. Me: Has he donated to your campaign? Primo: No. If he had given money, I might feel a little more like sharing information, but he has not donated or asked to volunteer or anything. Me: Then that's just weird. Primo: It gets weirder. He sent me that long email and then just a few minutes later, sent me a facebook message asking if I had read his email! Me: What!? Is he Ted? Is it Ted demanding money? Primo: I know! The message was just minutes after the email! Me: Why does he think he can demand information? He doesn't even know you! Primo: I know! That was yesterday. I didn't answer so he called me and left a voicemail today! Me: It's like he is going to the Ted School of Negotiation. Me: Did you wash the basil, too? Primo: No. Just the tomatoes. Me: Why didn't you wash the basil? 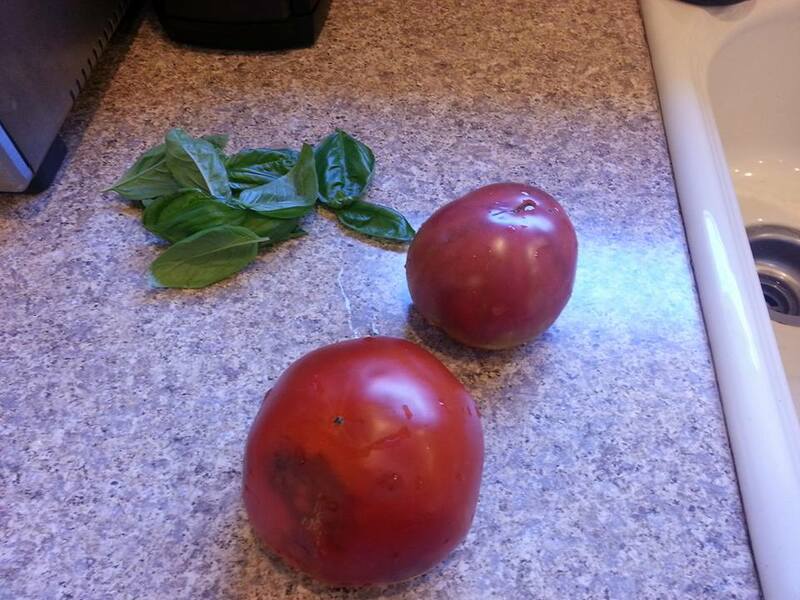 Primo: Because you only asked me to wash the tomatoes. Me: But the basil is for your salad. I brought in the tomatoes then went out to the garden to get the basil and then I put the basil next to the tomatoes and you didn't think to wash the basil, too? Primo: You only asked me to wash the tomatoes!